When data are collected under a variety of different conditions the meaning of the data can be hard to see. Stratification within a process can lead to hidden underlying patterns. In the Color / Symbol drop-down list, select Operator. 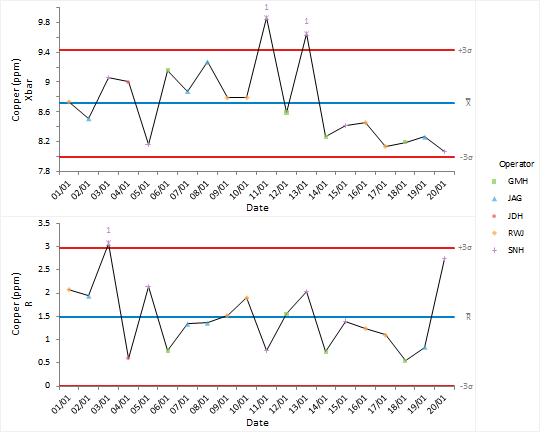 Control chart points are plotted using a symbol and color depending on the operator. It is easy to see that the operator SNH was responsible when the out-of-control signals occurred. After investigating the causes of the out-of-control condition we document them in the worksheet alongside the data.